Adding piping to a seam can make a beautiful statement. It can add an interesting splash of color to an otherwise dull seam. 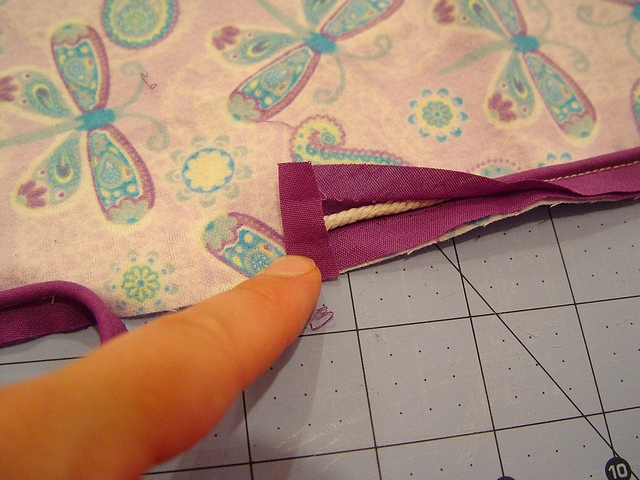 I’m going to show you how easy it is to add piping to any seam. First off lets look at some feet. The foot on the left is a zipper foot. 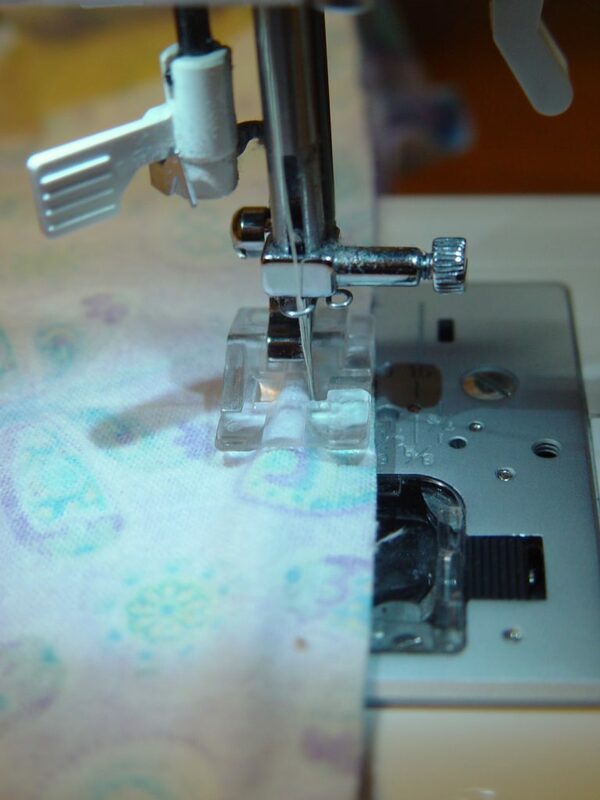 Most sewing machines come with a zipper foot. This can be used to put in piping, so no additional feet are needed. 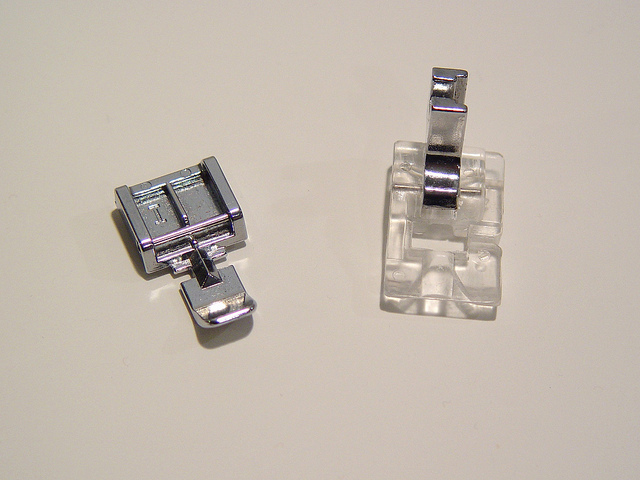 But if you’re willing to invest a few dollars, you can get a piping foot (shown on the right), and adding piping becomes simple. A piping foot is shaped perfectly to follow the piping and sew it down at just the right place. Don’t worry, I’ll show you how to use both feet to put in your piping. Here’s what piping looks like. It’s a small piece of cording wrapped in fabric and sewn in place. It’s not difficult to make your own, but for the most part, purchasing it is very nice. 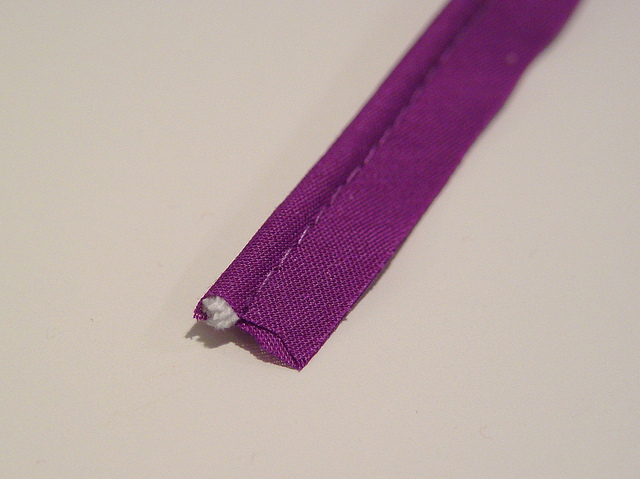 When attaching piping to your fabric, place it raw sides together, so that the cording is facing inward. 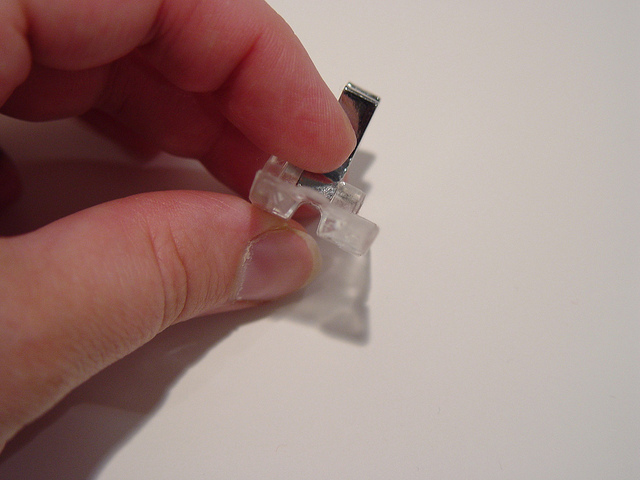 Pin with edges aligned. Store-bought piping leaves 3/8″ of fabric from the sewn line on the piping to the edge of the piping, so we can easily use a 3/8″ seam allowance for our projects. 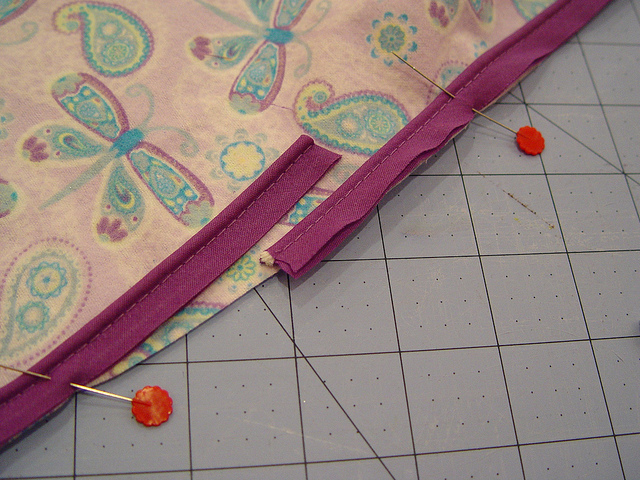 When pinning your piping to your fabric, leave an extra tail of about 2″ – 3″. When you reach a corner, clip the piping from the raw edge up to the sewn line (but not through the stitching) and rotate it. 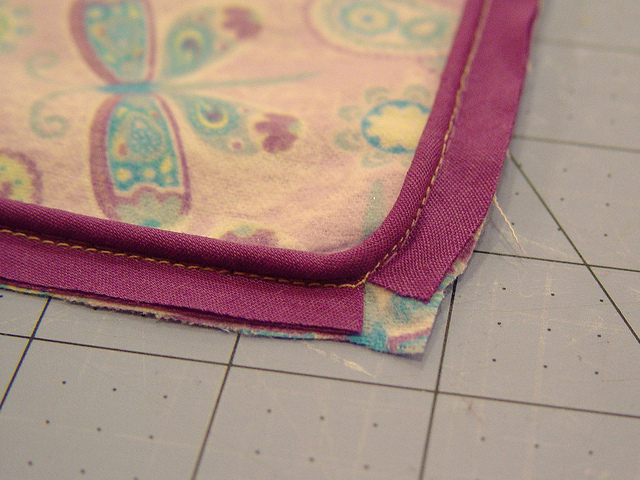 If you’re using a 3/8″ seam allowance, you’d clip the piping 3/8″ from the corner. 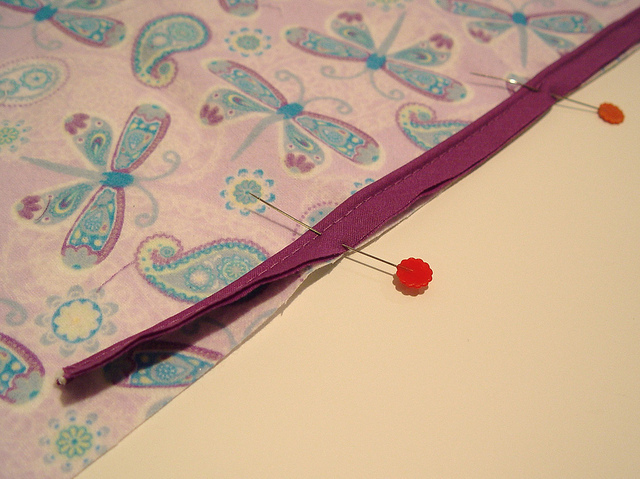 If your corners are rounded, simply clip darts in the piping to allow it to curve. Again, make sure you don’t clip through the stitching on the piping. When you’ve pinned all the way around, leave a tail at the end. 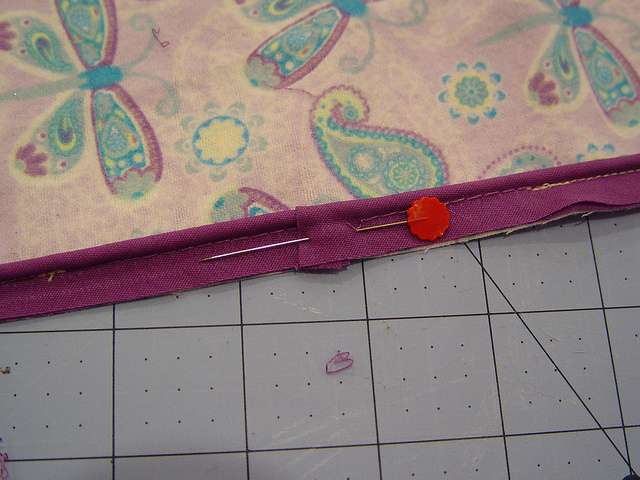 Attach your zipper foot and place the foot so that it’s next to the cording in the piping. Move the needle so that it matches up with the stitching. I moved mine over as far as I could to the left. Attach your piping foot and place the “bump” of the piping in the hole of the foot. 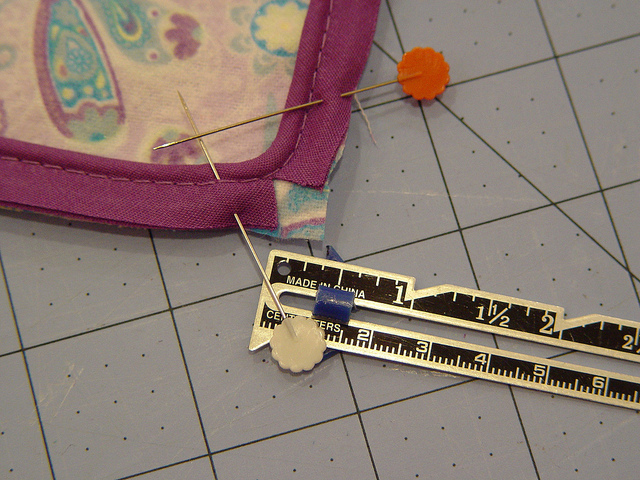 Move the needle so that it is lined up with the stitching on the piping. 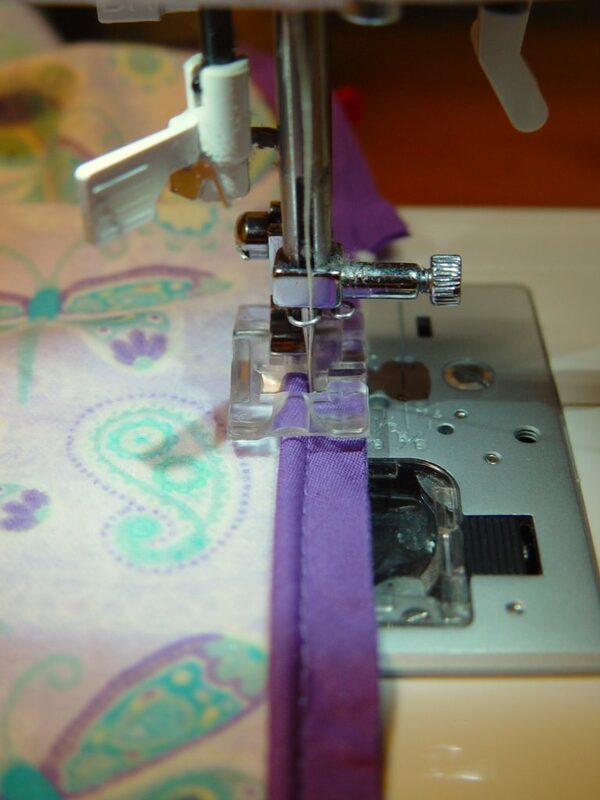 Sew around your project, following the piping all the way around, working corners carefully. 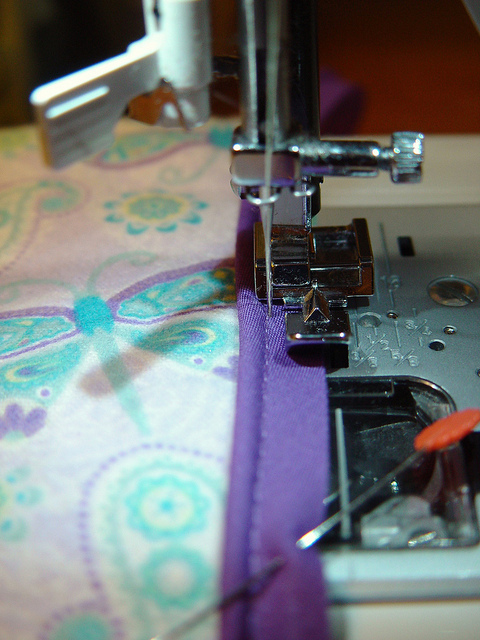 Make sure you leave 2″ – 3″ not sewn at each end. When you get to the end, stop a few inches before. 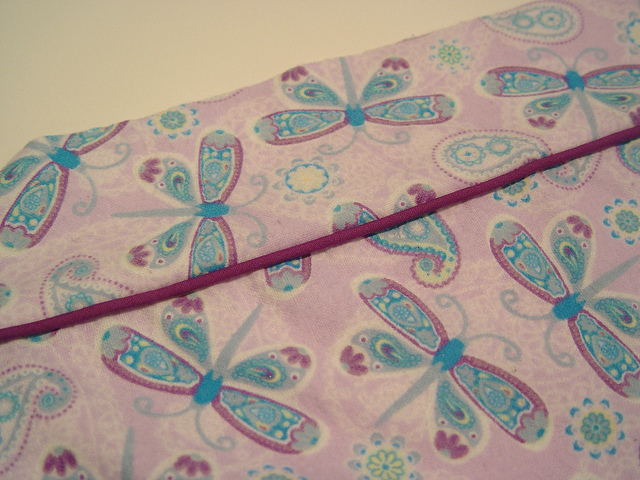 Pick one side of the piping and open up the stitching with a seam ripper. Line up where the piping will meet when on top of each other and trim the excess cording so there’s no overlap of that. 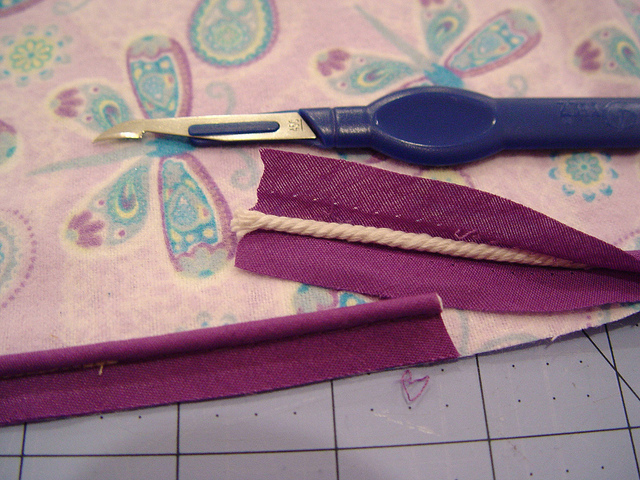 Fold the fabric covering the cording (on the side you trimmed) over the cording. Place the other bit of piping on top. 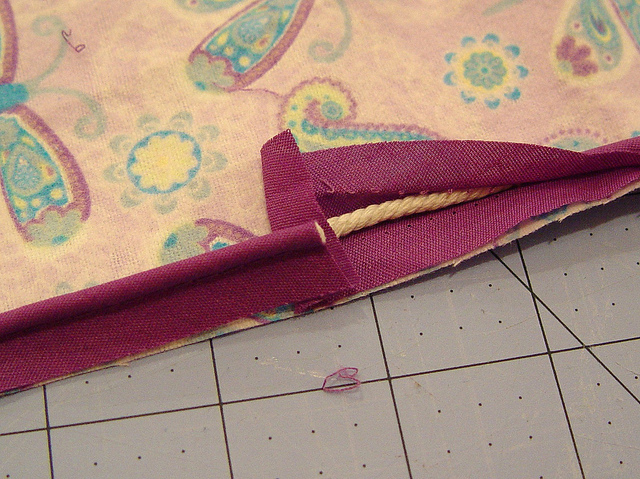 Fold over the fabric covering the cording over the other piece as well and pin in place. 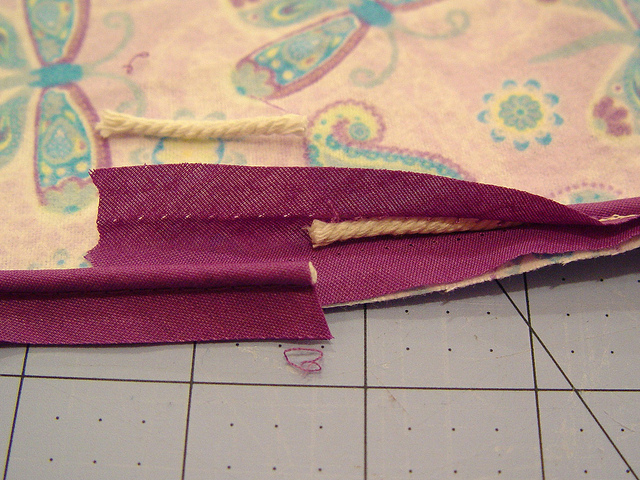 Sew the remaining bit of piping down to secure. When adding another piece of fabric on top of the one with the piping attached, align the edges as normal, placing right sides together. If you’re using a piping foot, you have a nice advantage because you’ll automatically follow the piping since it’s in the ditch of the foot. A zipper foot can be used, but you’ll have to be a bit more careful. So when you open your seam, here’s what it looks like with the piping! Here’s a simple little project that uses piping. I have always wanted to try piping, but was too afraid to try it. I think I could do it now, thank you! And I had no idea there was such a thing as a piping foot… who knew!! Awesome. Thanks so much. Wish I knew before I started the project. Thanks! I’ll have a look later tonight if I have a piping foot. I didn’t even know they excisted! You made this look so easy! I have a piping foot that I bought and was too scared to try it. I may have to kick my rear in high gear and do this now that it looks so easy! Great job and THANK YOU! A great tutorial! 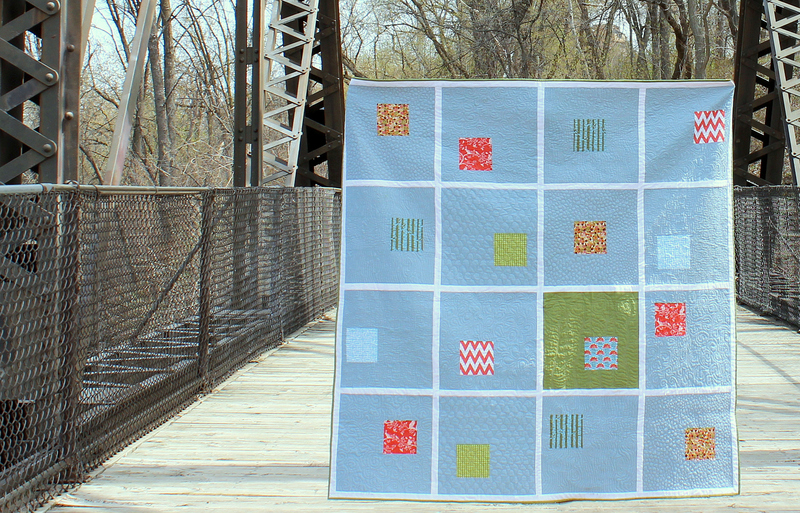 I have done this before on a quilt and love the way it looks. I may have to get one of those piping feet, it would be a lot nicer. Thanks for the tutorial!! Now I can try piping and feel comfortable knowing that I’m doing it right and not just winging it with what seems right. Great tut!! Sent it to my daughter! Can you tell me where one can find a piping foot? 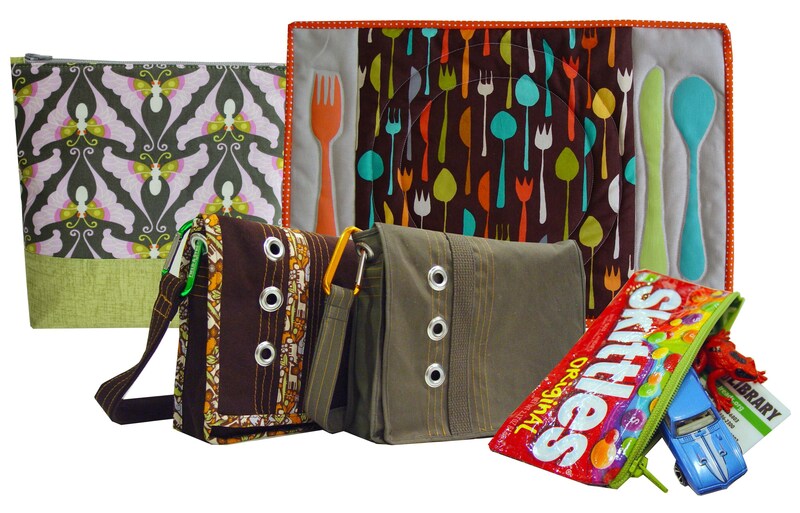 We don’t have much in the way of sewing in my town, and the next town over is 92 miles away…something tells me they wouldn’t have it either. I found a couple of feet that are zipper/cording feet, but they don’t have the ditch, they just have one side off like the zipper foot does. I’d also check amazon. They should have some too. I’ve looked at a lot of on line instruction on piping/welting, and this is by far the best. Many thanks! Thank you for sharing! Very helpful. thank you! this was one of the best tutorials I saw online for piping – It can be hard to teach yourself, but the step by step large, clear photos are what really helps for me, thanks again! 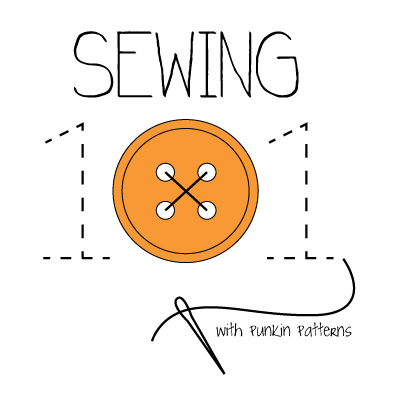 I’m sewing piping around the edges of a blanket, the blanket has two “sides” or two pieces of fabric– do you recommend sewing or basting the piping to one piece of fabric first and then attaching the second piece of fabric so I can see what I’m doing and the piping doesn’t shift? Yes! Sew it to one piece first. Then when you’re attaching the second piece, make sure you sew on top of the first piece again so you can sew directly over your original sewing line to make sure it hugs the piping perfectly! Thanks for the great demonstration. I have not sewn piping since school (20+ years ago!). Thanks for the tutorial. I am about to try my first pipping project. But when adding your second piece of fabric, don’t you mean place the _right_ sides together? I am new at this so I am easily confused. Oh, my gosh, yes — thanks for pointing out my typo. I’ll correct it. Just take it slow around the curves and you should be fine. Its really helpful to me…. Thanks for all the info! I’m a 25 y.o guy wanting to bust out my moms old sewing machine so I can re-do the piping of the seats on my car! =) this was the first tutorial to pop up and it’s great makes me feel like I can do this now! There should be one that would fit a brother. Check with the manufacturer. Hello, I have been trying to sew on piping for a while now! I’ve tried fabric glue, tape & marking with chalk. It’s very difficult bc ur sewing blind, so I’m playing hit & miss on all my projects. I’m getting better but, takes a lot of skill to do! You do make it look easy peasy, thank you for this. I got a 42 foot set but the foot that looks like your piping foot is labeled “Plastic Invisible Zipper Presser Foot”. Does that sound right or is it multi-functional/ do you use the same type of foot for both those things? Thanks for any help! Not sure. My zipper foot and piping foot look very different.